The master gunman from the world of Metal Gear Solid makes his debut in SSBB. 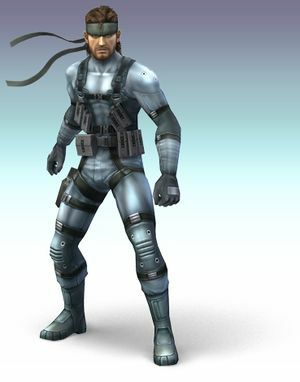 Snake is an extremely powerful heavy-weight character that has all manner of gadgets and weaponry. He has very good smashes, great projectiles, and strong throws, making him very powerful. Sadly, he can't do very well in the air, and should be kept on the ground most of the time. A powerful recovery technique used by the pros is the 'C4 Jump'. What you do is, when you get knocked off, use your Cypher to get close to the stage, and then, right before the cypher disappears, drop a C4 and blow it up. If you time it right (when to drop it during the Cypher boost, in particular) you will hit Snake with the blast of the C4, allowing you to use another Cypher! This lets Snake recover over incredible distances! When using the final smash, try and hit a little bit below the opponent about 3-5 times to successfully K.O. your opponent. Punches twice then kicks. Good for doing a quick 14% and knocking the opponent back to use snakes projectiles. Able to kill most characters around 120%, so it's better for doing damage instead of KOing. Is also great for comboing into forward A if you cancel after the first punch (to do this, quickly crouch in-between the first and second punch, then stop the crouch immediately and do both hits of forward A). Snake knees the opponent then punches them out. Does more damage depending on where the opponent is hit. Usually a better choice than his neutral A combo because it does more damage and still launches about the same distance. This move can also lock opponents with its first hit. + + + + Leg Blow Damage:12% if hitting an airborne opponent, 13% if hitting an opponent on the ground. Snake kicks upwards. This move is known for its ridiculous speed, range and power. This is easily Snake's most reliable KO move, able to kill most characters at about 100%. Snake crouches down and kicks. Although it is fast and has good power, Snake's up A is just as fast with more damage and vertical range and the same horizontal range, so this move shouldn't be used too often unless you're worried about staling your up A.
while dashing while dashing while dashing while dashing Dash Lunge Damage:11% to opponents on standing on the ground or in midair, 9% to targets laying down on the floor. Lunges straight into the opponent. A great move because it can be used to hit an opponent before a dacus uses the up smash and it has great range for a dash attack. The only problem is if it is used right next to an opponent then it will completely miss the opponent. Smash + + + (Smash + ) or (Smash + ) or Rocket Launcher Damage:22% uncharged, 30% fully charged. Fires a rocket at the ground in front of him. It has the higest base knockback out of any forward smash in the game. This makes it an extremly powerful move near the edge (in fact it can even KO under 25%.). While it does huge damage and base knockback, it is slow with about a second of starting lag and about half a second of ending lag, the entire move takes about two and a half seconds. It also has only moderate knockback scaling compared to it's base knockback. However, its good range and huge power make it a decent smash, but don't expect to get many hits in on experienced players unless you read an expected move, such as getting off the ledge, and is the third strongest forward smash in the game. Smash + + + (Smash + ) or (Smash + ) or Mortar Damage:4% from taking out the mortar, 10% from the shell. Fires a mortar straight up. Taking out the mortar on an opponent will deal 4% and launch them up where the mortar shell will hit them, letting this move do 14% instead of 10%. Unlike most smashes, charging will not increase the damage of the mortar shell, but will instead launch the shell farther up. Great for edgeguarding any character, but not particularly useful anywhere else due to most aerial attacks being able to go right through it, although you could try to punish a landing opponent who hits it. Smash + + + (Smash + ) or (Smash + ) or Land Mine Damage:14% uncharged, 19% fully charged. Plants a land mine in the ground. Although it is good to plant in strategic positions such as near ledges or plant one to launch an opponent into, it will explode from anyone, even you and your teammate(s), so it isn't advisable to use this often in teams since your grenades and C4 are already enough your teammate has to pay attention to. Low urgency in doubles, and medium urgency in singles. It's slow to plant, however, so you should only plant it when an opponent (or both if you want to use this in doubles) is KO'd or recovering from offstage. Planting one while one is already out will make the other one disappear. Snake chokes his opponent. It is relatively fast for a pummel attack, but it shouldn't be used too much unless you are certain the opponent cannot break free in time. Snake flips the opponent away. At low damage you can easily combo it into a dash attack, but generally outclassed by Backflip Toss due to having lower knockback, although it could still be good to use based on direction to throw the opponent offstage. Snake throws the opponent backwards. Almost the same as Snake's forward throw, it can also potentially combo into a dash attack. However, this throw will cause opponent to lay on the ground instead of land standing like Snake's forward throw. Higher knockback than forward throw. Snake tosses the opponent upwards. At low damage it can easily combo into an up tilt or up aerial, but other than that it is generally outclassed by every other throw unless you are really good at juggling an opponent with a poor down aerial such as Marth. Can also be used to throw opponents straight into a C4 or Land Mine that is on a platform above you. Snake lays the opponent on to the ground. Not only is it Snake's most damaging throw, but it can also chain grab if you run the right direction when an opponent rolls, but they can do a attack on the ground instead, so be quick to shield if you mess up. If you can predict the opponent you can also get great combos off from this, such as a forward A on most characters if they roll forwards or an up A on any other getup option. Kicks four times. The last kick has very high knockback. If you know how to use this well, use it a lot, for 28% is huge damage and you can kill in only 3 or 4 of these attacks if you land all hits. However, keep in mind skilled opponents may SDI out of the last hit, which leaves you very open to punishment. This is still a great move though, especially for edgeguarding when used with the Mortar. + + + + Leg Slam Damage:14% in leg, 15% on tip of foot. Brings his leg down like an axe. A powerful meteor smash. Although it is a good meteor smash, it is slow and only the tip of Snake's foot will cause a meteor smash, whereas the leg just launches the opponent up (still with good knockback.) Only use if you can easily hit moving opponents on the tip of Snake's foot. + + + + Rear Kick Damage:10% if sour spotted, 14% if normal hit,16% if sweet spotted. Thrusts his legs behind him. It has great speed, great knockback, and a disjointed hitbox. One of Snake's best moves, it has a sweet spot at snakes center of mass at the beginning of the attack and a sour spot anywhere a little after the move starts. Only downside is it's long landing lag. + + + + Up Thrust Damage:10% if sour spotted, 14% if sweet spotted. Thrusts his legs upwards. Just like his back aerial with just a little less landing lag and facing up. It can also be used to juggle a little bit on opponents with poor down aerials, but Snake's slow speed doesn't make him the best juggler. However, it doesn't have a third hitbox for 16% like Snake's back aerial. Stomps downwards four times. Does huge damage and the last stomp does huge knockback. Snake can get all four hits on his opponent in a single short hop right next to an opponent, but this has very long landing lag. Just like with neutral aerial, skilled opponents can SDI out of this attack, but against opponents who do not know how to SDI well this is a devastating punishing move, and can also be great to combo out of a down throw. Hand Grenade Damage:2% from impact of regular throw,3% from impact of back tilt throw,4% from impact of forward tilt throw or from impact of regular item throwing,12% from explosion. Hold the button to hold on to the grenade; release the button to throw it. Tilt the control stick to alter the distance of the throw. You can have two grenades out at a time, and anybody can pick up the grenade after thrown. The best use of grenades is to bring one out, shield or grab (which causes the grenade to drop), and then picking it up and throwing it as an item. The grenade's fuse is about 3 seconds, so you can "cook" the grenade so opponent's won't have enough time to throw it back. One last tactic for Snake's grenades are to throw one, then get another out and either shield or grab. This will make the other grenade fall instantly, stopping all horizontal and vertical movement. This will also make a grenade fall out of an opponents hand or a teammates hand, making it fall right next to the person who was holding it. 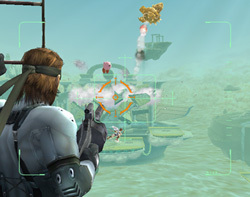 Snake's grenades are amazing projectiles, being able to be completely controlled and used around walls such as on many transformations of Pokémon Stadium 1. If you are ever at far or medium range, use these, and they can also be great at close range, as getting hit while you are holding one will usually make the grenade explode (unless spaced perfectly), even if you are in your shield. They can also be used this way to help Snake get out of combos and some chain grabs if not performed perfectly. Plus, even if Snake gets hit in this way, he can survive longer than anyone but King Dedede, so trading damage is usually a good deal. + + + + Nikita Missile Damage:7% if it hits an opponent after releasing control of the missile,14% if it hits while you are still controlling it. Use the control stick to steer the missile. Press the shield button to release control of the missile. Unfortunately, this makes you completely vulnerable, as releasing control of the missile even takes a second for Snake to be able to move, and the missile is slow, especially while making it turn. Also, opponents can attack it with any attack and change its direction and cause it not to explode while they are attacking it. The missile will make it about one and a half final destination lengths before you automatically lose control. You can also have multiple missiles out at the same time, but this move is still only really useful for edgeguarding, but in that department it is severely outclassed by Snake's Mortar and neutral aerial in almost every situation that could ever happen. + + + + Cypher Damage:6% for hitting an opponent after Snake releases it. Only ever use it as a recovery move. The cypher will continue to fly up after Snake releases it, possibly hitting an opponent. Unlike most recovery moves, Cypher will allow Snake to use a move in the duration of the recovery or after the duration of it, not putting you in the helpless state. Another interesting thing about Cypher is it gives you invincibility from being launched by low knockback moves. However, strong launching moves such as smash attacks and meteor smashes will not be stopped, and you always take the damage of the move, even if it is a low knockback move. This recovery does have one major flaw though: if the Snake is grabbed in his cypher, and not hit with a pummel or throw, when the character is released he will not be able to use his cypher unless he gets hit while falling. If this happens, try the C4 technique I mention in the next move. Perform once to set the charge on the ground (or on an opponent! ); perform again to blow it up. If you set the charge on an opponent, it will eventually be able to switch who it is on with the same noise than is heard when you first set it on an opponent. This makes it great for teams; you can set it on a teammate and when it switches from your teammate to an opponent you can blow it up. Can also be used to save yourself from falling, as blowing yourself up lets you get another cypher. It can also be used to set traps, and in combination with Snake's grenades, land mine, and possibly even Mortar, he can lock down an area of the stage with great efficiency and make it hard for opponents to approach, often finding themselves running straight into a grab, forward A, or up A. In addition, if it is on an opponent, you can blow it up and shield to perfect shield so you can do it next to it, however this does not work if it is on the ground, so be careful. Whips out a cardboard box and hides under it. + ( or )+ or or Whips out a cardboard box in a slightly different way and hides under it. + Whips out a cardboard box in a 3rd way and hides under it. Press it for only a split second when on Shadow Moses Island, and Snake contacts Colonel Campbell, Mei Ling, or Otacon on the codec to talk about one of his opponents. If you do this while fighting Falco, Slippy calls him instead. This works for everyone he faces, including himself. If interrupted, the message will not appear. Snake yells 'It's showtime!' before calling in a helicopter and starts firing grenades from the passenger area. The weapon only has two magazines, with six rounds each, so it is best to simply unload as many grenades as possible before the time expires. The grenades deal a considerable amount of damage and has a fairly large area of effect. They do have a slight delay, though, so aim where you think an enemy will be in half a second, instead of where they are at the moment. Should be easy. Just attack him before he issues his final smash moves or if he uses his final smash you're doomed. You are significantly faster than ganandorf so try to find high ground and barrage him with your projectiles. This will also help you avoid his very powerful close range attacks. If he does get close either run away or get behind him and perform snakes high knock back combos. Then barrage him with long range weapons again. Stages that move or large stages will help you face him. King Dedede is a big target for all of Snakes basic and special attacks. Just watch out for many of dededes hammer attacks. About the same story as Ganandorf, but he has a recovery move. He has a very (very) poor air game so when he uses his recovery move, he is most vulnerable. If he is at high percentages, shoot him with a guided rocket. If not, fly over to him and kick him as far as possible or even wait for him to land and perform combos. The key to this battle is using his speed against him. Your projectiles will not be as effective against him. Instead, place c-4 or land mines for him to set off. If you can dodge his speed attacks near the edge, he will almost certainly fall off. He has weak recovery moves and he is very vulnerable afterwards. Use that to perform a high knock back move. If you have time, fire the rocket at his feet. It should knock him off. Staying on a different level against him is also helpful. About the same strategy as Ganandorf. His close range attacks are very powerful and have massive knock back. Stay away from him for the most part. He has no recovery moves so knocking him off should be first priority. Rack up percentage with projectiles and drop down on him and use combos or a foot rocket to blow him off. He also has no projectiles so using the guided rocket won't be an issue. About the same strategy as Bowser except that he is quicker. His lasers are deadly and quick so stay away if at all possible. Fox excels at combos but has no real knockout moves. His recoveries also aren't the greatest. Stay above him and pummel him with grenades and guided rockets. If he is directly below you, drop down and blow him up. You completely overpower him close range. Send him off with a foot rocket and if he comes back hit him with a guided rocket or punch him off. His aerial game isn't overly powerful either. Pit will be more of a challenge. Not only does he have one of the best recoveries in the game, but he has a reflective shield. You can get under his shield by using the mortar, and the grenades will also do damage. For Pit, you will need to get some of your damage through items. He is a very light character so it won't require to much percentage but still be careful. He is pretty fast so be careful to get out of his combos. Land mines are also effective against Pit. The best strategy against him is to avoid his arrows and combos while focusing on getting behind him and picking up items. Marth is very good. Stay away from close contact as his combos are menacing and his dolphin slash. He has no projectiles and no real horizontal recovery so use this to your advantage. Shielding will be very important against him and try to get behind him when she is using his combos because they are long. Then you will be able to punish and at high percentage use the foot rocket. Flat stages will be the best when fighting him. Also, try to dodge his finishing attack because if he misses he will kill himself. Link out ranges you in his regular attacks so for the most part you should stay away. He has a variety of projectiles and attacks, but they are not nearly as accurate or as long range as Snake's. He doesn't really have a recovery and he is fairly lightweight so he will be ko-ed easily. Stay away and keep on moving courses so he shouldn't be a problem. This page was last edited on 18 July 2016, at 00:37. This page has been accessed 76,551 times.